Dream interpretation exam, test, trial. Dreaming that you are going to take an exam or actually taking an exam (and maybe even failing?) is a very common theme in dream interpretation. Actually, this theme is one of the ten most remembered in dreams. But what does it mean? Exams in dreams as a symbol of a real trial in life. Yes, it really is quite simple. Often the dream is about an upcoming – or a finished – test or exam in life. This can be a real school exam or another type of trial or test (job, relationship etc.). It has been proven that people who work in performance-related jobs (for example giving talks and lectures, teaching or management roles) often dream about being at exams – or quite simply dream about the situation in which they feel they are at an exam (their job situation which they see as a trial or test, that is). Dreams about exams (or tests) might symbolize an upcoming decision that needs to be made about you rather than by you. It can also symbolize a new phase in your life (maybe becoming a parent), and the question is then if you’ll pass or fail. Dreaming about exams as a symbol of low self-esteem/self-confidence. Naturally, the dream might also mean that the dreamer (you?) is living with a sense of low self-esteem; that you don’t think you are living up to the trials in your life, but it might also mean that you perhaps have an unacknowledged performance anxiety or anxiety towards authority. 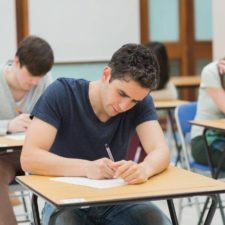 If the low self-esteem or the performance anxiety is dealt with, well, then you might dream that you are passing your exam, and you may realize that the exam you are taking in your dream – and that you are exposing yourself to in real life – may not even be necessary! NOTE: Dream interpretation is not always an easy skill, and when you dream about taking exams, it is almost certainly about something different for you than it is for someone else dreaming about exams. It is crucial that you feel the interpretation fits you, and it might be the case that the above interpretations do not suit you and your situation. Have you had a difficult dream about taking an exam that you can’t really understand or that you’d just like to share? Feel free to comment below. i dreamt i was in an open acres of land, belong to big men in my country like d ex president and others, in one of the hunt i saw mold image of husband and wife of ex president , i also saw building in some part of it in which i saw a rich man and his daughter in one of the upstairs hold hand at the balcony disusing so i was admiring them also admiring the land talking within me to myself that so this is the place where all this big men came to buy land and hide as i was thinking-talking ,i was walking away along the road a guy came with his car beckon on me to enter but i refuse because i was thinking within myself in that dream that maybe all the big men saw i have discovered their secret so they sent him to kidnapped me. i then follow a foot path which led to tiled express road on getting to the express i check if is still following me but i discover hes still behind so i went my way. 2. i dream i was in a rough classroom with scattered chair preparing for exam, i took my time to arrange the chair and i got my own seat too, then i went to the invigilator to collect my own exam script, i saw plenty people standing to collect exam script but it was just only one exam script that was remaining so on getting to him after the a talk with him he handed the one one exam script to me that the man kept it for me i should go on with my exam. I had a dream twice about writting exams and I was searching for answers amongs my exam mates, in the second dream of writing exams the same description above took place but this time I even gave my class mate my paper and pen to write down answers for me since he is fast in writing than me. Instead of him writing on my paper he started making calls ignoring my paper and writing on a rosted corn that’s still on the fire, all effort to bring him back to mt paper proved abortive. Please what’s the meaning of these two dream? Thanks. Last few weeks i am continuously giving exam in my dreams but everytime either i can not participate in exam due to many reasons like i am late reached in examination hall or if i reached may be i am not know the questions answer which are given in examination paper or i dont rememember exam date or i dont found seat to sit for giving exam. It happened continuously in my dream every night last few weeks. I always dream of taking exam in a dream and I always see a girl in the dream each time I am writing the exam (same girl) most of the time, I won’t know what am writing, as in my paper will be blank, but yesterday’s dream, I was writing exam and I saw the same girl, but this time have written and it got to an extent that my pen started over floating, I collect her own pen to write, it over float too. Pls what is the meaning of the dream? This girl in question we do drag position during our secondary school days. I hate seeing her in my dream. I can’t interpret dreams but if you keep seeing a particular girl in your dream and the both of you are not friendly. As a Nigerian, you should know what to do. #pray! I saw that i am sitting on bech and i give written exam for job in company . I dreamt that I was in my highschool classroom. The friend beside was dead ( she is not dead in real life). Then I was taking my English exams. But I could not complete the test , I knew the answers but the time was up.